"No one knows the real truth about Baba. The world knows some facts about his life after his sixteenth year. He was born in September 27, 1838, and attained Samadhi on Vijayadasami day in 1918. During his lifetime he taught many sacred things to the people and performed many remarkable deeds. He was worshipped by many devotees." The two bodies are different, but the Divinity is One. The first advent (Shirdi Sai Baba) was for revealing Divinity. The second advent (Sathya Sai Baba) is to awaken the Divinity (in human beings). The next advent (Prema Sai) is for propagating Divinity. The three Sais are Shirdi Sai, Sathya Sai, and Prema Sai. The reason for relating all this is that today happens to be the birthday of Shirdi Sai Baba (September 28, 1835). Shirdi Baba attained samadhi in 1918. Bodies are transient. These vestures are assumed only for the sake of devotees. Unless the Divine comes with a form, no one can develop faith in the Formless. The Divine in human form is the preparation for comprehending the formless Absolute. "During the examination on commission, Baba was asked: "What is your father's name?" He replied, "Baba." (Baba means "father" and the reply meant that the father's name was "father"). Q. "What is your religion?" A. "The religion of God." Q. Wherefrom did you come?" A. I Have come from the Aatma." Q. "What is your caste?" A. "The caste of the Divine." Baba answered all the questions in this manner. Earlier he had been hailed as "Sai." In his examination, he had given his father's name as Baba. 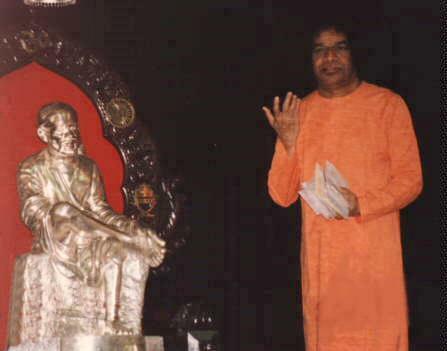 By the combination of these two names, he was therefore called "Sai Baba." "So, according to My Dharma of Bhakthasamrakshana (protection of devotees), I had to rescue him. Of course, this is not the first time that I have taken on the illness of persons whom I wanted to save. Even in the previous Sareeram at Shirdi, I had this responsibility... This is My Leela, My Nature. ...When I save a person, I save him completely. I do not wait until he gets the disease and I do not leave in him a fraction of the disease, so that he may be identified later. Even in Shirdi, Dhadha Saheb, Nandharaam, Balawanth, all were saved by these means. Balawanth was destined to get plague, but, the bubo was taken over and the boy saved." "It is significant that Sathyanarayana was giving clues about his kinship, nay, identity, with the Saint of Shirdi, even from his childhood. When finally the formal announcement was made by Sathyanarayana that He was Sai Baba, of Bharadwaja Gothram, Apasthamba Sutram, and of Shirdi, he was asked, "If you are Sai Baba, show us some miracle now! ", and, the boy, said, "Bring me some jasmine flowers"; when they were placed in His hands He threw the flowers on the ground and, lo, they fell in the form of the Telugu letters, Sayi Baba. ...He who came as Sai Baba has now come again as Sathya Sai Baba! Moreover, the Sais come in a series. After this Avathara, there will be another, Prema Sai, who will take birth in the Mysore region" He added."